This replacement pump is designed for use with the Supra alternating replacement mattresses. 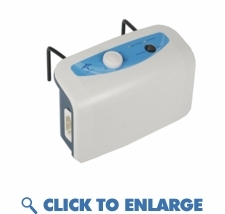 This whisper quiet pump operates on an 8 minute cycle time and is designed to heal up to the beginning of stage 3 bed sores. Quick lock connectors secure the air hoses to the pump. Static button suspends the mattress into a non-alternating mode so patient can easily transfer in and out of bed.